The Wacker Neuson WPP range are strong and robust vibrating plates powered by the famous Honda GX160 engine. Ideal for compacting asphalt and interlocking paving stones while also being suitable to compacting stones in narrow spaces. They are robust and durable and designed to be used day in day out in the construction of paths and by horticultural and landscaping contractors. 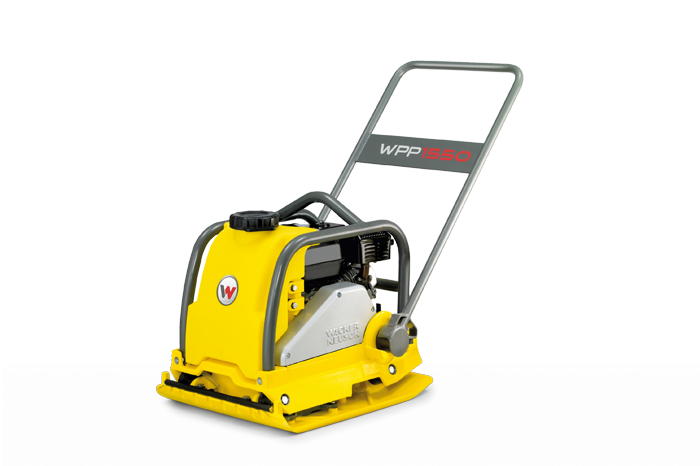 Equipped with a integrated transport roller with its unrivalled stability, the vibratory plates of the WPP range can be easily manoeuvred with precise direction. This model is available with or without a water tank. The petrol control is easily accessible for easy operation of the device. The handles are also isolated from the machine so the the operator does not get fatigued easily while using the WPP wacker. The robust and low maintenance design ensures that the life span of the WPP wacker is very long. This is complimented by the strong farm which protects the engine, the high quality V-Belt and the ductile graphite iron base plate which is highly wear resistant. The water tank is also removable from the WPP wacker without the use of tools making it easy to refill. with the spraying system delivering even water distribution across the whole base plate through automatic flow control only when the wacker is vibrating.